Bittersweet Golf Club in Gurnee, about 1/2 hour north of Chicago and minutes from the Six Flags Amusement Park, is an 18-hole championship facility featuring play on a course that combines the best of golf with the beauty of nature. 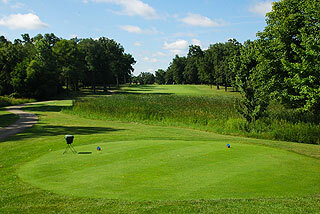 Mature hardwoods, natural wetlands with abundant wildlife, and 10 year old sedge meadows and prairies are featured on this rolling layout, which will test the shot making abilities of all levels of golfers. An over-riding characteristic are the plateau green complexes that are prevalent on much of the course - creating the need for accurate short iron and wedge play. Many of these medium sized greens are surrounded by undulating mounds, bunkers or wetlands - with only limited room for error. Another outstanding feature are the expansive marsh areas that often line the fairways and sometimes come into play off the tee. 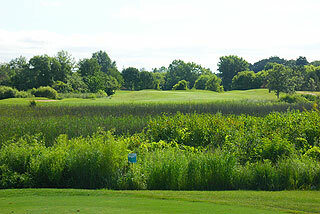 In fact, golfers playing from the two back tees will be challenged with forced carries over water hazards or wetlands on several holes. These carries can be demanding, especially if the wind is up. Those playing from the two front tees will find the course very playable, as these hazards are taken out of play or at least reduced dramatically from these tee boxes. Great thought process here - challenge the experienced players, but allow high handicappers and beginners a way to enjoy this beautiful course without making too many donations to the considerable hazards. On course golfers will find yardage blocks posted in the center of the fairways, with some sprinkler heads also measured to the center of the green. Color coded flags indicate the day's pin placement, and each tee box also provides measurements to the green's center. There is a driving range on property along with two practice greens. The clubhouse features a simple pro shop, with a snack/lounge area offering lunch items and beverages, plus an outdoor deck and patio. Groups of up to 80 players can be accommodated for outings. 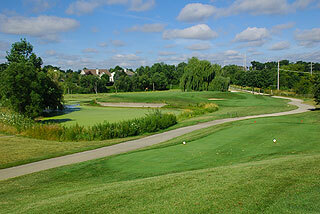 The black tee areas play to 6833 yards with a formidable slope rating of 138. The white tees are next - measuring a challenging 6334 yards with a 134 slope, and 3 par fours of 400 yards plus. High handicappers will definitely want to play from the green tees, sloped at 125 for men and 133 for women, at 5614 yards. The forward sets measure 5027 yards with a 125 slope rating. As the slope ratings indicate - golfers can expect a challenging round of golf, demanding length as well as accuracy. The opening hole provides an ample landing area off the tee, but narrows with water along the left from 145 yards in, and plays to an elevated green. 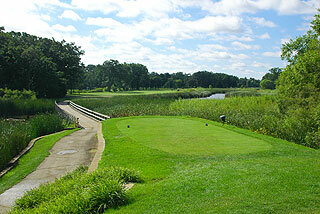 The par five second starts from an elevated tee area, with water right and bunkers left on the fairway. Most players will lay up to the safe landing area about 100 yards out, avoiding the water hazard on the left that comes into play from 150 in. Long hitters may attempt to reach in two, as there is a little bit of room to the right of the putting complex. Be advised not to miss to the left on the par three 3rd, as a water hazard awaits anything hitting the slope on that side. The narrow tee area on four opens up to a wide fairway with the 100 yard area providing a safe landing zone. There is water left and room long right on the approach to this beautiful green complex. The par three sixth is also a beauty, with a brick retaining wall defining the green. Accuracy is a must here, as there is water short, left and long. 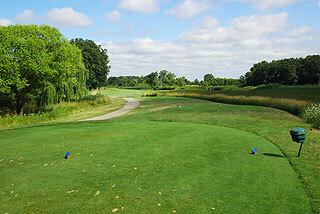 Seven doglegs to the left near the 150 yard area, with a tee shot shaped towards the left center the ideal play. The downhill approach is a simple one. Aim left of the tree line on the par four 8th and long hitters beware - the water hazard deep left of the fairway is reachable, and the fairway slopes towards the hazard. 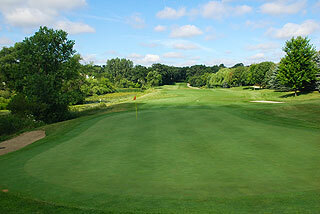 The second shot is demanding with water immediately left and trees right, with the green sloping towards the hazard. The closing hole on the front begins with a long carry over a marsh, with the wetlands extending all the way to the green along the right. The back side opens with another forced carry off the tee on ten, this time to a generous fairway that presents plenty off room all the way to a mounded green complex. Golfers from the two back tees will hit over water from sculpted tee boxes - with perhaps the most significant carry of the round on 11. The views with a long wooden bridge leading to a manicured fairway are outstanding here. There is room left on the second shot, but the fairway ends near the 100 yard marker, leaving a wedge approach to a putting complex with trees on both sides. There is ample room to the right center of the fairway on 12. With a pond short right and a bunker left of the green, long is better than short on the approach. The par three 13th appears simple from the tees, but miss this green and the up and down from the mounds and bunkers surrounding it will make par a challenge. A carry over another marsh to a narrow, tree lined fairway is featured off the tee on 14. There is ample room on the second shot, but the approach to an elevated green is challenging, as a pond sits precariously close to the right side. Water is in play to the left of the fairway on 15 near the 150 yard marker, with room to the 100 yard area for shots staying right of center. There is some room left but a marsh sits immediately right of the green on the approach. 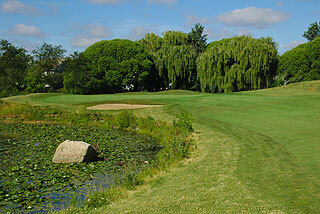 A tight tee shot is next on 16, with trees left and wetlands right that run all the way to the raised putting complex. There is room for error short of the long par three 17th, but left, right or long is trouble. The green tees here play to just 133 yards, compared to the whites (190) and the tips(203) making this a completely different golf hole for high handicappers. 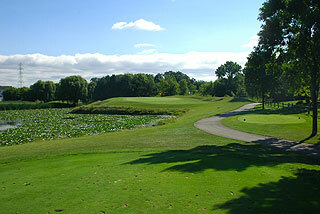 The ample fairway on 18 ends near the 140 yard area, though there is plenty of room far left of the natural area. A simple approach can be ruined if the second shot strays too far right - into the marsh. Bittersweet is easily accessible off I-94, with the drive from the airport nearly all freeway. Rates are a great value at $39 weekdays and $59 weekends including cart. The weekday rates have to be considered as one of the metro areas best deals. The course is beautiful - AND challenging. Bring your "A" game! For more info visit our informational page for Bittersweet, with a link to their website, by clicking here .